Bread & Kaya: Looks can be deceiving! My 3rd issue of Bread and Kaya was published by Digital News Asia on 7 March 2013. A COUPLE of weeks ago, I received a message with the title “Looks can be deceiving!” on my blog’s Facebook page, from an unknown user. In the message, the user claimed that a certain celebrity was having an affair with another celebrity. Unknown to the user, I happen to know former and I alerted that celebrity. A day after that, the user deleted her account! Fortunately, I saved a screenshot of the message. Coincidentally, I found that someone had searched for the celebrity’s name on the day the message was sent and landed on my blog. My blog captured the transaction, together with the Internet Protocol (IP) address, time-stamp and other details. It was the only transaction searching for the celebrity’s name. There was also a record to show that the user clicked on the link to my blog’s Facebook page. From this, there is a possibility that the author had found my blog using the celebrity’s name (and my blog appears on the first page of search results) and decided to send me that message. A query on the IP address shows that the user resides in Malaysia and is thus subject to the laws of Malaysia. The celebrity may file an action in court to obtain the user account details of the IP address if she wishes to. Alternatively, she may make a police report against that person. The lesson of the story is: If you want to do naughty things online, remember to mask your tracks (e.g. by using proxies); otherwise the law will come knocking on your door. Internet trolls have been living amongst us and many still roam the streets of cyberspace. This brings me to the topic of this article: Section 233 of the Communications and Multimedia Act 1998. Section 233 makes it an offence to post any content which is obscene, indecent, false, menacing or offensive in character with intent to annoy, abuse, threaten or harass another person. Anyone who does so is liable to a fine not exceeding RM50,000 or to imprisonment for a term not exceeding one year, or both, and shall also be liable to a further fine of RM1,000 for every day during which the offence is continued after conviction. It’s a widely used tool by law enforcers to nab Internet trolls. What amounts to obscene, indecent, false, menacing or offensive in character is quite wide. Making prank emergency calls (PP v Sow Kuen Chun; Criminal Case No. 63- 01- 2008); and insulting the Sultan (PP v Muslim bin Ahmad;  1 AMR 436); offensive comments (Nor Hisham Bin Osman v PP; Criminal Case No: MTJ(2)44-14-2010)), and (PP v Rutinin Bin Suhaimin (Criminal Case No. K42-60-2010)) are examples where people were charged under Section 233. PP v Muslim bin Ahmad and PP v Rutinin Bin Suhaimin are both recently decided cases and they relate to the Perak constitutional crisis. Both men had allegedly posted offensive comments towards the Sultan of Perak after Barisan Nasional took over the state of Perak. Both men alleged that they did not post the comments, notwithstanding that the IP addresses point to them. Muslim bin Ahmad was acquitted by the Sessions Court and Rutinin bin Suhaimin was discharged by the Sessions Court without his defense being called. The prosecution had apparently failed to show that the persons who posted the offensive comments were the accused. I am told that the impact of the said Sessions Court decisions was one of the reasons why Section 114A of the Evidence Act 1950 was introduced – that is, to facilitate the prosecution in proving the identity of the maker. To recap, under Section 114A, a person is deemed to be a publisher of a content if it originates from his or her website, registered networks or data processing device of an Internet user unless he or she proves the contrary. This new law sparked a massive online protest dubbed the Malaysia Internet Black Out Day or also the Stop114A. However, the High Court subsequently overturned said Sessions Court decisions. Rutinin Bin Suhaimin’s defense was called. Interestingly, the learned High Court judge was of the view that calling the Sultan of Perak names has the tendency to cause annoyance or abuse to any person, thus falling within the ambit of Section 233. Muslim Bin Ahmad was handed a fine of RM10,000 for each charge and six months’ imprisonment. He pleaded for a “binding over order” (released on probation). Surprisingly, Section 114A of the Evidence Act 1950 was never relied on by the Courts. In fact, the High Court in PP v Rutinin Bin Suhaimin said that 114A is not applicable because the postings were made before the enforcement date of 114A (July 31, 2012). This ruling is interesting as it may be a defense for website owners who can argue that 114A does not apply to posting made by their users prior to July 31, 2012. Nevertheless, these laws and cases serve as a reminder that the Internet is not a ‘wild, wild west.’ Netizens need to be accountable for what they say. Further abuse by netizens attracts further legislations by Government. Unfortunately, website owners now face the brunt of 114A due to the actions of their users. Their pleas for the repeal or amendment of 114A are still unanswered. 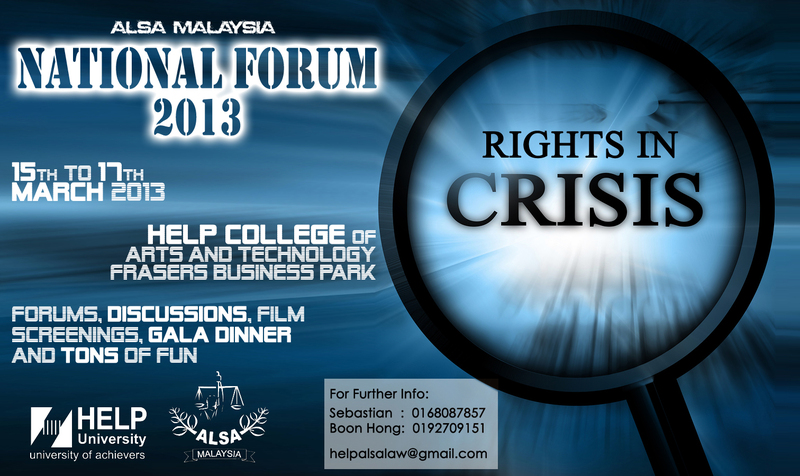 I will be speaking at the ALSA National Forum 2013 on the topic “Cyber Law – The Light in 114A Cyber Law Development in Malaysia” on 16 March 2013. The other speakers will be Miss Jaspal Kaur Sadhu Singh of HELP University, and Mr Anselm Charles Fernandis from the Attorney’s General Chambers. I was interviewed by BFM Radio on Internet Freedom and Evidence (Amendment) (No. 2) Bill 2012. Lawyer Foong Cheng Leong breaks down the Evidence Act to us, and explains how such regulations affect the ordinary Internet user in the country. KUALA LUMPUR: Internet users whose accounts are hacked into will be presumed guilty for unlawful online posts by the actual perpetrators under recent amendments to the Evidence Act, something that is being criticised as absurd. The Evidence (Amendment) (No 2) Act 2012 will reportedly hold Internet users liable for any content posted through their registered networks or data processing devices. “For example, if someone parks outside your house and uses your Wifi to post (illegal content online),” said KL Bar Council IT committee co-chairman Foong Cheng Leong. Participants are all ears at the forum. 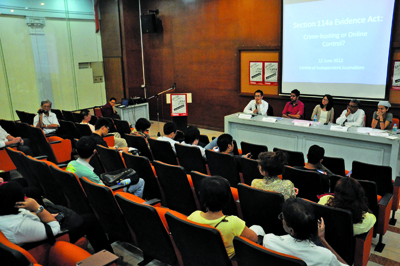 He was speaking during the “Section 114A Evidence Act: Crime-busting or Online Control?” forum at the KL-Selangor Chinese Assembly Hall recently. Foong said laws presuming guilt have always been around, including for individuals who were deemed to be traffickers if they were arrested with a certain amount of drugs. “The Dangerous Drugs Act (discourages) people from carrying drugs. Will this Act (discourage) people from using the Internet?” he asked. Center for Independent Journalism (CIJ) director Jac SM Kee said the Act was illogical as victims who sought help after their accounts had been hacked or report the crime to police may find themselves behind bars. Even if someone else posts an offensive comment on a person’s Facebook wall, the latter could be found guilty. “Business will be affected. If they provide Wifi (and offensive items are posted through their connection), they are responsible,” said BFM Media Sdn Bhd producer Jeff Sandhu. He said if restaurants in the city are required by law to provide free Wifi and their Internet connections are open to abuse by irresponsible users, business owners will find themselves caught between a rock and a hard place. Digital News Asia executive editor A Asohan said the Act put average Internet users at the mercy of tech-savvy users who could abuse the former’s unsecure Internet connections. He said an analyst from investment firm Mackenzie traced 4.1 per cent of the nation’s Gross Domestic Product (GDP) coming from online activities. “You want to create a high income nation, this is going to put damper on it. You can’t have an Internet community when people fear to go on the Internet,” he added.